Children with Autism spectrum disorders (ASD) often suffer from deficits in communication and social interaction, which lead to various social challenges in interacting with peers in collaborative tasks. The application of Collaborative Virtual Environment (CVE) technology in ASD intervention brings advantages in providing a safe, flexible, and collaborative environment. 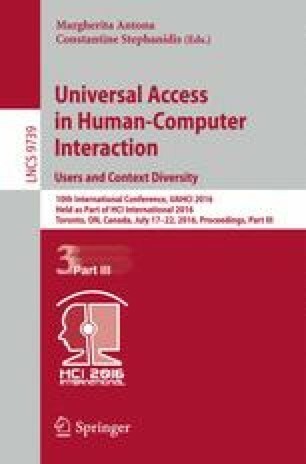 This paper proposes and describes the development of a novel distributed CVE system for playing a series of collaborative games using hand movement that is tracked in real-time via cameras. These games aim to positively impact the social interaction of users. A usability study indicated potential of this system in fostering collaboration and communication skills among children with and without ASD. This work was supported in part by the National Institutes of Health under Grant 1R01MH091102-01A1. Some virtual objects and pictures in the CVE system were obtained from free online repositories, such as Unity assert store.